Race for the Perfect Bet! Win a €1,000 bet on Live Roulette! One winner, one bet. That about sums up the thrilling leader board race happening right now at Casino Pop. All players compete for the first spot in a fiery 4-day competition by collecting points for wagering on slots as well as table games and for scoring big wins. The top scorer by midnight on Monday will win a massive €1,000 bet that will be placed on Red or Black on their Netent Live Roulette Table. Plus, 14 runners-up will be rewarded with consolation prizes in cash and Epic Free Spins. Roulette is one of the world’s most popular table games, and many famous movie scenes took place at the wheel in the casino. Take the chance to enter and get your suit (or dress) on, because this is going to be one magical moment if make it all the way. 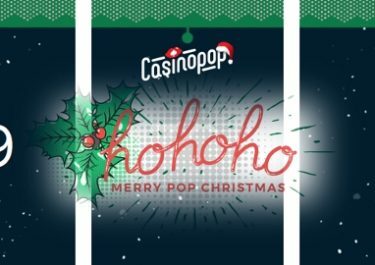 CasinoPop gives all players the opportunity to join the race for this once in a lifetime gaming experience. In “The Perfect Bet” one will win the amazing thrill of one single bet of € 1,000 that will be placed at the roulette table on red or black, LIVE. Race against your fellow POPfans to make it to the top of the leader board by midnight on 5th February 2018. Terms and conditions apply. The player with the highest amount of points will win a €1,000 bet that will be placed on RED or BLACK at the Roulette Table from Netent Live. The winner will be contacted within two days after the 5th February 2018 to agree when the final bet will be placed. Consolation prizes are: 2nd – €700 | 3rd – €500 | 4th & 5th – €300 | 6th to 10th – €200 | 11th to 15th – 100 Epic Free Spins on a selected slot.